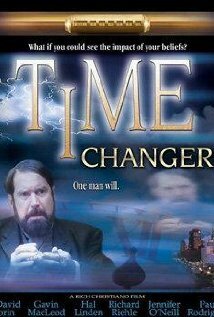 Carlisle (D. David Morin), the protagonist of TIME CHANGER (2002) would be horrified by Premature. An 1890 seminary professor of science, he’s just written a ground-breaking book claiming that ethics can be taught separately from Christianity, and at times (dealing with nonbelievers) they should be (this was not a new idea at the time, I’ll note). This horrifies Carlisle’s colleague Anderson (Gavin MacLeod) who tells him this is a world of fail: there’s no morality without Jesus (Carlisle doesn’t point out that Anderson’s example, “Thou shalt steal” predates Jesus by a few centuries) and saying otherwise gives the illusion you can be saved without Jesus. In Anderson’s view, it’s better to teach no morality at all than take Carlisle’s position. Jennifer O’Neill as a former Hollywood type turned born-again Christian (as she was once a big-name star, this is presumably meant to be meta) tells Carlisle that secular entertainment is Satan’s greatest tool: even the Hays Code of the 1930s was Satanic because it gave movies the appearance of morality even as they moved further away from Jesus! Finally realizing Anderson was right, Carlisle returns to the present and rewrites his book. After he tells Anderson that 1990 was The End Times Anderson begins experimenting to see how far in the future the Earth lasts. His machine won’t let him reach 2100, or 2070 … OMG, how close are the end times to the times we’re living in? This gives me perverse respect for Doonby which at least had a plot, not just a list of religious-right talking points. Which include that children can no longer pray in schools (that’s an outright lie), and that if you just tell someone “Jesus died for your sins” and explain it, that will convert them. I know from Slacktivist and other blogs that this is a staple belief—no-one Carlisle evangelizes too ever questions his assertion of fact, claims a different religion or really knows about Jesus (“No-one ever explained it to me like that.”). There is, of course, no discussion of the vast moral improvements since 1890, such as equal rights for blacks and women, which would ruin the message (Carlisle might very well find black and female equality immoral, but that wouldn’t serve the movie either). The closest thing to suspense is two cops trying to figure out who Carlisle really is, but it never amounts to anything: they don’t arrest him, don’t pose any threat to him getting back to his own time, they’re just a fake thrill. It gives me more respect for Doonby and What If, which at least had an actual plot and some drama. Two questions I can’t answer are a)whether Carlisle is a reasonable portrayal of a Christian of his time or just a figure made up to express modern conservative Christian views’ b)what the intended Christian audience made of this (assuming the audience swallows what the media tells them is often a mistake). Two movies. Poles apart in worldview. And both dreadful.